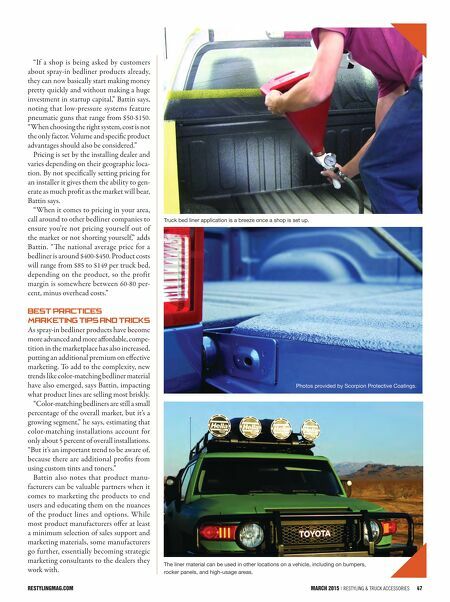 restylingmag.com March 2015 | Restyling & tRuck AccessoRies 47 "If a shop is being asked by customers about spray-in bedliner products already, they can now basically start making money pretty quickly and without making a huge investment in startup capital," Battin says, noting that low-pressure systems feature pneumatic guns that range from $50-$150. "When choosing the right system, cost is not the only factor. Volume and specific product advantages should also be considered." Pricing is set by the installing dealer and varies depending on their geographic loca- tion. By not specifically setting pricing for an installer it gives them the ability to gen- erate as much profit as the market will bear, Battin says. "When it comes to pricing in your area, call around to other bedliner companies to ensure you're not pricing yourself out of the market or not shorting yourself," adds Battin. "e national average price for a bedliner is around $400-$450. Product costs will range from $85 to $149 per truck bed, depending on the product, so the profit margin is somewhere between 60-80 per- cent, minus overhead costs." 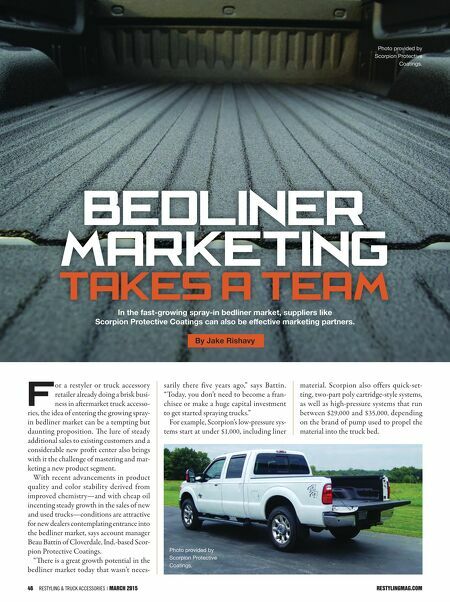 Best Practices: Marketing Tips and Tricks As spray-in bedliner products have become more advanced and more affordable, compe- tition in the marketplace has also increased, putting an additional premium on effective marketing. To add to the complexity, new trends like color-matching bedliner material have also emerged, says Battin, impacting what product lines are selling most briskly. "Color-matching bedliners are still a small percentage of the overall market, but it's a growing segment," he says, estimating that color-matching installations account for only about 5 percent of overall installations. "But it's an important trend to be aware of, because there are additional profits from using custom tints and toners." Battin also notes that product manu- facturers can be valuable partners when it comes to marketing the products to end users and educating them on the nuances of the product lines and options. While most product manufacturers offer at least a minimum selection of sales support and marketing materials, some manufacturers go further, essentially becoming strategic marketing consultants to the dealers they work with. Truck bed liner application is a breeze once a shop is set up. The liner material can be used in other locations on a vehicle, including on bumpers, rocker panels, and high-usage areas. Photos provided by Scorpion Protective Coatings.